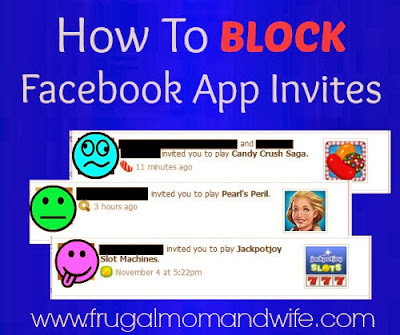 Frugal Mom and Wife: How To Block Facebook App Invites! How To Block Facebook App Invites! Tired of being bombarded with tons of Facebook app requests every time your online? Most people really do not care for them or are repeatedly sent app requests from the same person all day everyday. Once I even had someone send me an app request 7 times in 10 minutes. That's just ridiculous. Rather than delete your annoying friend how about blocking them from being able to send you requests in the first place. They will never know you blocked them from sending app requests. Below you I show you exactly how to accomplish this. *First off you will need to be logged into Facebook. *Then find out who is sending these app requests to you and take note. *Go to your Account Settings to the upper right hand corner of your FB page. *Once there, click where it says "Blocking". *Go over to where it says "Block app invites". This is where your friends name will be inputted where it says "Type name of a friend" to block them from sending you app request. Once there name is submitted, you will the be able to see their name under the submission box. You can at anytime undo this action by clicking the "x" next to their name. This will block all app invited from that person regardless of the app. They will never know you blocked their app invites and you are annoyance free! THAT'S IT! Thanx especially with the pictures, I am utterly clueless on Facebook. I know what you mean about the constant requests. Now I am off the block a bunch of facebook app junkies.